Low ratings have plagued Passions since its debut. NBC officially announced the supernatural soap's demise and in the same breath trumpeted the expansion of its morning show, Today. Though an official announcement has yet to be made, Soap Central has learned that Passions will ends its eight-year run on NBC later this year. 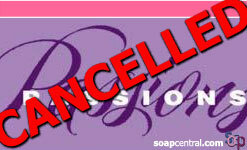 The cast and crew of the NBC soap were told on January 16th that the show had been cancelled. While Passions has remained at the bottom of the ratings pack throughout its run, there are several bright spots that could potentially allow the show to live on somewhere outside of NBC's place on the dial. Speculation of Passions' impending doom first surfaced earlier in the month with it was reported that NBC planned to expand the run of its morning news show, Today, to a fourth hour. NBC is expected to have a hard time selling an expanded Today because it will mean that local affiliates will have to give up an hour of their local programming in order to accommodate the expanded morning show. Unfortunately for soap fans, that's where Passions comes in. In order to give that hour back to local stations - which make up large parts of their revenue by airing syndicated programming - NBC needed to give up an hour elsewhere in the daytime lineup. The decision to scrap Passions was one of economics. Today is the most profitable program in NBC's lineup and it is believed that the network plans to use an extra hour of Today as a way to increase its profit margin. On the flip side, Passions' sagging ratings resulted in the show having to slash its budget last year. NBC Entertainment president Kevin Reilly noted, "The daypart has just gotten extremely tough financially. You know, it was a moneymaker for us for so long, and now the margins are just brutal and that's all the way around. That's not unique to NBC. And unfortunately, we do need to make money on these, and we certainly can't lose money. The economics just mandate that we [cancel Passions]." Passions is unique in NBC's daytime lineup in that it is owned outright by the network. Owning the show means that NBC does not have to pay licensing fees to another company in order to broadcast the show. All four of CBS's soaps are owned by other entities while all of ABC's soaps are owned by Disney, which is the parent company of ABC. It is this ownership that may provide a glimmer of hope to Passions fans. Passions remains a popular option for young women, part of the much sought after demographic sought out by advertisers. According to NBC, during the of January 1st-5th, Passions notched its highest-ever ratings -- a 1.5 rating -- in the women 18-49 demographic. It is this appeal that has led many to believe that NBC will try to find a way to keep Passions alive. At present, there are at least two options that appear viable. First, since the youth market tends to be more Internet savvy, it is possible that NBC will try to work Passions into an Internet-based soap. Fans could tune in online to watch the show or possibly pay to download new episodes via any number of online multimedia services. Recently-aired episodes of Passions are currently available for viewing on NBC's web site and for purchase on Apple Inc.'s iTunes. Another option would be to allow another network to broadcast the soap. Variety reports that NBC might be shopping Passions to Disney-owned SOAPnet. A deal might allow a 30-minute version of the show to continue on. Reruns of Passions previously aired on the Sci-Fi channel, but they were abruptly stopped due, in part, to less-than-stellar ratings. It is unclear at this time exactly when Passions will end. NBC's contract with Passions ends in June, but the expanded version of Today will not air until sometime in September. It is possible that NBC execs will try to extend Passions' run in order to fill the void between the end of Passions and the debut of Today's fourth hour. NBC's contractual obligation to Passions ran through June, however, the network had hoped to reach a deal that would prevent there from being a "gap" between Passions' end and the start of the super-expanded Today show. Passions will last air on September 7, 2007.